Skateboarding is an action sport where injuries are common! It is a game of doing tricks and activities while rolling over the skates. Skaters can move with it on walls, benches, rails or any other surface. There is a risk of injury even to a skilled skater. However, there are some techniques following which a skater can prevent himself from happening any mental and physical injury. Overcome your Fear: In the initial practice sessions, many skaters face serious injuries that may be healed with time physically. However, whenever they stake again, there is a fear that resists them to take any daring act again. Skating is not safe without self-confidence, skaters should not try doing rock ‘n’ rolls and board slides until they are completely ready for the same. Listen to your instincts and do it with proper care to prevent yourself from happening any injury! Warmup: Once you have the right mindset to perform skating the next important thing is to do necessary stretching and exercise. This can help the body to prepare for any twist and turns or any quick action that may result in an injury. Do exercises that are focusing on legs, core, and calf. It is also known as a pre-skate warmup or pre-skate stretching and exercise. Check out your Attire: Always check your clothes, shoes, and helmet about whether they are proper for skating or not! Right footwear made for the purpose of skating provides right support, protection, and grip for your feet. As per experts the essential skating equipment’s for a comfortable and safe riding are knee pads, wrist guards, helmets, elbow pads, and gloves. Keep practicing the Right Technique of Falling: It’s pretty obvious that one or the other day you’ll fall off the skateboard. Since the board is narrow and also the wheels on it make it very hard for you to keep it under your control. So it’s best if a skater can better practice about how to fall well by avoiding the previous mistakes. This activity can help a skateboarder much in preventing the body from any major or minor injury. Choose the Right Environment: To avoid the risk of collision with any pedestrians, vehicles or any obstacle it is advised to skate in the proper place. The place should not be irregular. In many countries, there are skating parks designed for the skaters. There are professionally designed “ramps” and “bowls” to make the skating experience completely safe. Never use any homemade skateboard ramps that might result in any surprising accident. Also, skateboards should not be used on wet surfaces. Do not practice skitching (an activity to ride skate while holding either rear or side of a moving vehicle) as you might be thrown off or fall badly. Avoid traffic since no one knows when a vehicle will stop, turn or slow down and you might not be lucky to avoid any injury every time! Skateboarding is Fun, a recreational activity among teenagers and youths. 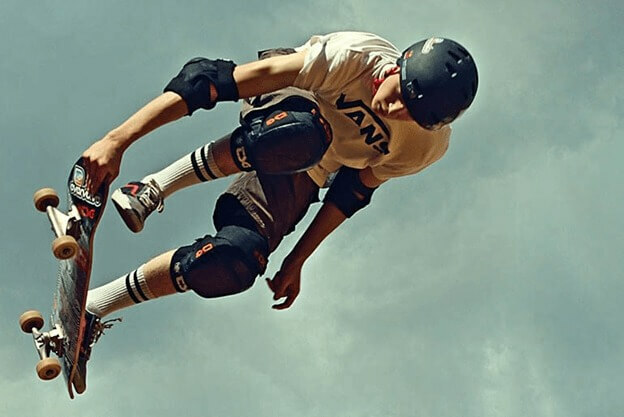 There are many risky stunts while skateboarding spin-offs like mountain boarding and longboarding are pretty common. It is the responsibility of both children and their parents to follow the safety precautions to avoid risks. Staking Precaution Tips are required because as per a recent study every year approx. 70k injuries are happening while skateboarding and are going to casualty or medical emergency department. So all we can suggest to skateboarders is - Ride Safe, Be Safe. After all, prevention is better than cure!